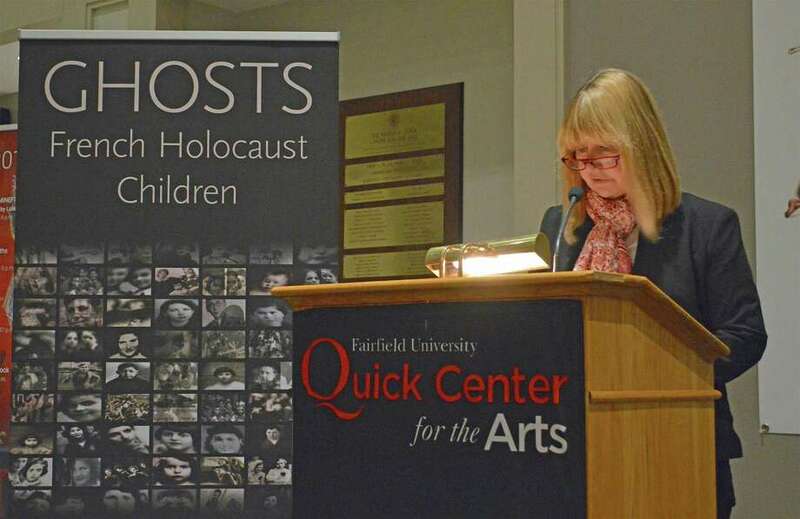 In Pictures / Holocaust Exhibit at Fairfield U.
FAIRFIELD — A poignant, somber and yet intriguing exhibition opened Wednesday night, Jan. 23, at the Fairfield University Art Museum, recalling the deaths of French children during the Holocaust. “Ghosts: French Holocaust Children” — a photographic and sculptural display collection created by Robert Hirsch, an artist and photo historian from Buffalo, N.Y. — employs hundreds of photos of the Jewish children who were taken away to concentration camps during World War II. There were more than 11,000 French children taken from France by the Nazis, and less than 300 of them survived. “They searched for pictures of these 11,000 children and they found about 900,” explained Casey Weber, executive director of the museum. “It’s special because Robert Hirsch, the photographer, has taken these pictures of French children whose lives were lost in the Holocaust (and) put them into smaller scale boxcars on the wall, has put them into large scale portraits,” Weber said, and consequently created a powerful and moving exhibit. “Ghosts” will be on exhibit through March 2.